The last thing anyone wants is smelly garbage in their kitchen. A simple, open garbage can cause odors and does not make for pleasing view in the kitchen. Under the sink garbage cans can still allow odors into the kitchen and can leave a mess. Garbage cans have entered the age of technology. Tall, short, and retro designs have become the norm. You can add to your kitchen design for find something you wouldn’t even know was a garbage can. Designs have developed that keep odors out of the kitchen, keep germs contained, and can blend in well with your kitchen appliances and décor. 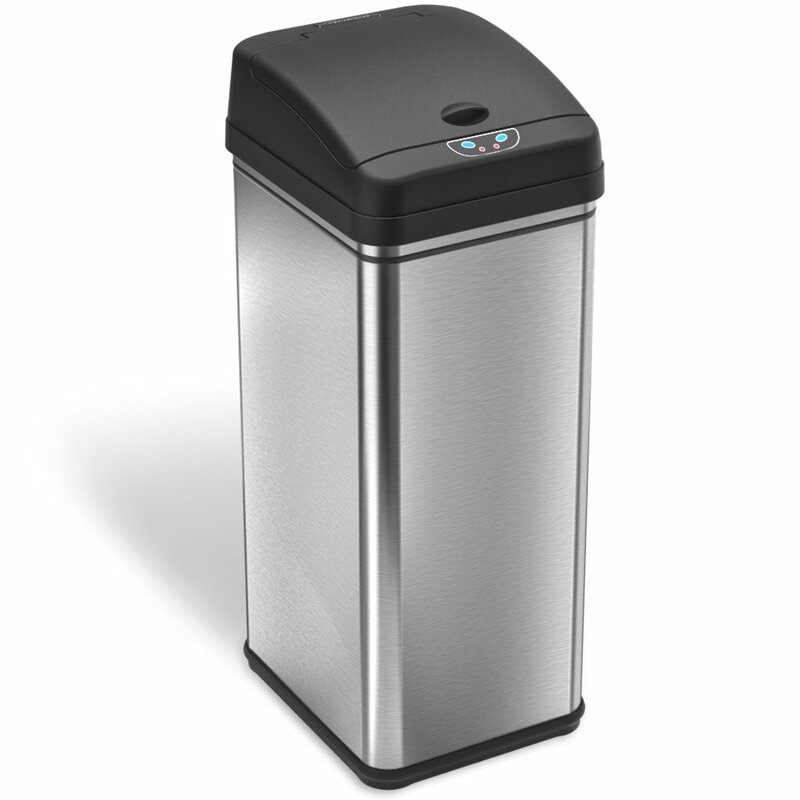 The Nine Stars DZT-80-4 Infrared Touchless Stainless Steel Trash Can (Nine Stars) is a combination of convenient features and modern functionality. The dimensions are 14.8 inches deep x 18.3-inch width x 28.7-inch height with a weight of 14.8 pounds. It is a 21-gallon trash can but it is recommended that you use 23-gallon trash bags or larger as 21-gallon bags can be difficult to find. Science has helped us understand the way that germs accumulate and spread in the kitchen. Stopping this spread of germs has become a major concern in the home environment. A trash can collect all of those germs and more. Nine Stars has taken these concerns into consideration and made a trash can that helps prevent the spread of unwanted germs. Having a trash can with a lid, such as the Nine Stars, has a number of health benefits. The lid prevents unpleasant odors from entering the kitchen. Smelly garbage is not the kind of odor you want floating through your home. It is uninviting and doesn’t create the welcoming atmosphere that most people want. A lid is also important because it keeps bugs and insects out of the garbage. Flies and other flying insects can land in the garbage and then spread germs to other locations throughout your house. Without access to garbage, these germs are going to stay where they belong. The Nine Stars uses infrared, motion sensing technology for lid opening. Move your hand with 10 inches of the sensor and the lid automatically opens. You won’t have to touch the garbage can to put the waste into it. This technology is important for two reasons. One, you don’t need to worry about getting germs that are already in the trash can onto your hands. With no lid to lift up, you aren’t transferring more germs onto the trash can lid as well. Two, with no lid to open, you are able to hold and put in items that take both hands. For example, you’ll be able to put a stack of paper plates in the garbage without the inconvenience of putting them down to open the trash can lid. The lid stays open as long as your hand or another item is within 10 inches of the sensor. It automatically closes after three seconds once there is nothing in front of it. This will give you enough time to put your garbage in the trash can without the lid closing on it. The last you thing you need is a garbage can lid coming down on your hand while you’re trying to throw away garbage. If this happens, you not only get the germs from the lid onto your hands but you also risk the chance of the lid knocking the garbage from you hand onto the floor. The automatic closing of the lid means that it can’t be accidentally left open. It assures you that odors are going to stay in the garbage where they belong and not waft through your home. Automatic closure also gives less of a chance for insects getting into the garbage while the lid is open. There is also an ‘open’ button on the lid that can be pressed if you want the lid to stay open. You may need this kind of feature when cleaning your kitchen after a party or when cleaning out the pantry. This feature lets you keep the lid open without having to activate the sensor. There is a ‘close’ button that you have to push to get the lid closed if it was not activated by the sensor. It is not recommended to push the lid closed by hand as this can damage the gears and automatic sensor technology. 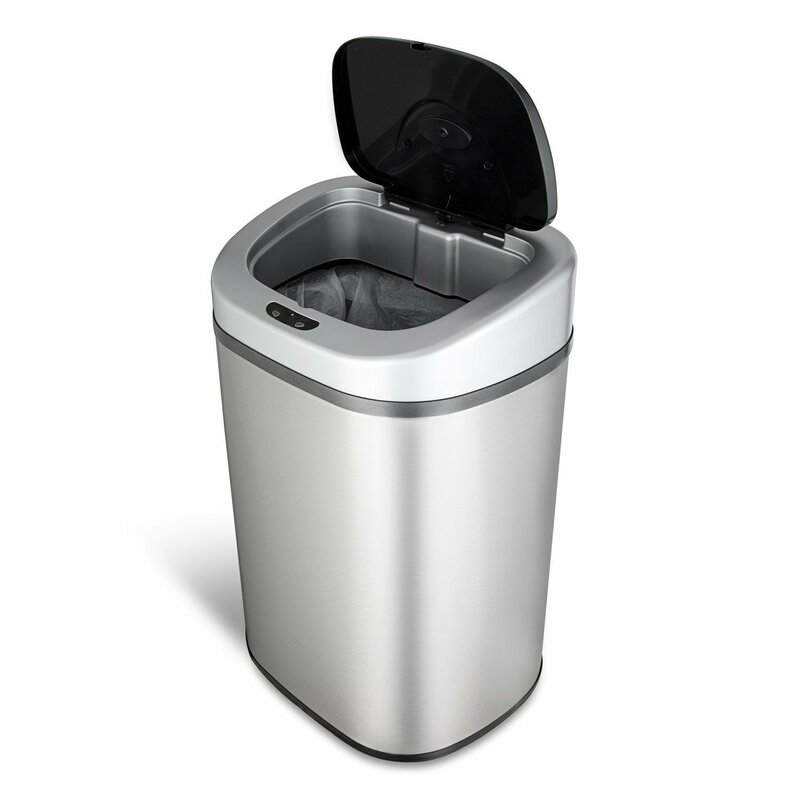 This oval shaped garbage can is made of commercial grade stainless steel and ABS plastics. Creating a cohesive kitchen appearance involves coordinating the look of your appliances. Stainless steel is a popular choice because of the sleek, unified look it can bring to the kitchen. A garbage can in matching stainless steel can seamlessly fit into any kitchen décor. The Nine Stars holds 21 gallons worth of garbage. This is large enough that you won’t have to take the garbage out every day. With a lid to hold the odors in, this longer wait time to take out the garbage will not affect the smell of your home. There is an inner ring liner that holds the garbage bag in place. This ring prevents the garbage bag from hanging out the sides of the trash can. It provides a smooth, clean look that won’t detract from the appearance of your home. Some users did have trouble getting the garbage can out of the ring when removing the garbage bag. If you want the bag to be completely hidden from sight, you need to be gentle with the ring so as not to break it. Without it, the garbage bag will show. With touchless technology, a stainless steel body, and a ring liner, the Nine Stars has a polished, professional appearance that make it suitable for the home, office, bathrooms, and spaces that may be open to the public. It keeps garbage out of sight and, while it has a good aesthetics, it can easily blend in with surroundings so that it’s hardly noticeable. This trash can combines technology with good design and aesthetic appeal. It runs on 4 D batteries and boasts the ability to be used for 10,000 times before needing to replace them. 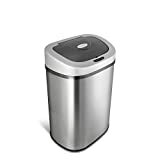 The iTouchless Deodorizer Touch-Free Sensor 13-Gallon Automatic Stainless-Steel Trash Can (iTouch) is a popular trash can that uses technology to deodorize the garbage area and provide touchless opening. The dimensions are a 13-inch width x 9-inch depth x 27 inches high and it has a 13-gallon capacity. It weighs 7 pounds. An extra-large opening of 11.75 inches (diagonally) gives you the room you need to throw garbage away without running into the sides. This helps prevent excess garbage from falling out or sliding down the side of the trash can as you are trying to throw it away. Touchless technology is the modern, convenient way to access your trash can. You don’t have to touch a dirty trash can lid and you can hold more items to put in at once. The iTouch incorporates a sensor that detects objects and within six inches and rapidly opens in response. The iTouch uses a patented Reflx technology that comes into play during lid closing. If objects are detected in the sensor zone while the lid is closing, Reflx instantly reopens the lid. For those with a large family or that frequently have large gatherings at their home, the Reflx technology will be convenient. When you have a lot of people throwing things away around the same time you don’t want them to have to stand and wait to dispose of their garbage. Children, especially, can have a hard time waiting and may try to open the lid or try to sneak garbage in before the lid closes, resulting in extra messes on the trash can and floor. The iTouch also uses a silencing technology to make using it nearly silent. While a loud trash can lid is not a very common complaint, this trash can is designed to be invisible in your home. As stainless steel appliances have become the norm in home kitchen design, having a trash can that fits in with this aesthetic is important. The stainless steel design of the iTouch helps it to fit in with most modern kitchen décor. This trash can comes with a carbon deodorizer to cut down on garbage odors. However, refills have to be purchased separately. Hands-free technology can help make cooking fast and easy as you won’t have to stop and wash your hands every time you throw something away. There are open and close buttons on the front of the trash can if you need to open it manually as well as an off switch in the back to deactivate the sensor. There are times when you may need the lid to stay open for longer than the sensor allows, such as during a big house cleaning. When taking out the garbage bag or when replacing batteries, you should turn the unit off completely for safety. The iTouch uses a garbage bag retainer ring to hold garbage bags in place. Some trash cans require special bags or only bags of a certain size but the iTouch can use almost any kitchen trash bag even a grocery bag as long as it is correctly inserted into the bag retainer ring. The ring, along with a quick opening and closing lid, is part of a whole system that helps keep odors inside the trash can. Some users did have problems with the lid of the iTouch, as it would begin to open and close randomly. Sometimes this problem was solved by cleaning off the sensor, replacing batteries, or turning the unit on and off but other times the lid had to be replaced. Forcing the lid open can damage the mechanism that opens and closes the lid and may result in malfunctioning. It runs on 4 D batteries. The iTouch also comes with a 1-year limited warranty and a 60-day unconditional money back guarantee. The simplehuman Semi-Round Step Trash Can (simplehuman) does not use new technology but relies on traditional hands-free design with solid construction. The dimensions are a 14-inch depth x 18.9-inch width x 26.5-inch height with a weight of 7 pounds. It has a 13-gallon capacity. Durability is a key feature for a trash can because they are used daily. The simplehuman is made of thick, durable plastic. It comes in 7 different colors – black, blue, fuschia, gray, mocha, stone, and violet. Plastic gives you the option to match a color to your décor. You can pick something that will blend or you can add a little pop or color. Plastic also gives you the benefit of flexibility. Not only can stainless steel trash cans be dented or scratched but those dents and scratches are far more evident in stainless steel. Plastic is flexible enough that it won’t dent, even if heavy objects are dropped on it. It can easily pop back into place. Scratches will be less visible on it as well. A semi-round design makes this trash can ideal to fit against a wall and out of the way. The semi-round shape gives you a higher garbage capacity and the flat back allows it to sit closer to the wall. This makes this trash can ideal for high traffic areas because you get both the capacity you need with little square footage taken up. The simplehuman uses a patented lid shox technology to control the lid. This technology slows the lid for a nearly silent closure. When the foot pedal is pushed, a damper forces air out, causing the lid to open quickly. But when the lid is closed it meets resistance that slowly lets the air back in, resulting in a quiet close. The lid can easily be left in an open position when you need to do a long cleaning job. To prevent the lid from hitting the wall, a wall bumper is incorporated into the back of the trash can. With the bumper, you don’t need to worry about the trash can damaging your walls. However, the bumper does move the trash can a few inches out from the wall. This may cause a tight fit in a narrow space. Many homes have an on-going battle with pets or young children that sneak into the garbage. The simplehuman has a locking mechanism on the lid that effectively keeps out hungry pets and prevents curious children from dumping out the garbage, saving you time and frustration. While simplehuman recommends their custom fit liners for this trash can, users have found that it works just as well with regular 13-gallon garbage bags. The manufacturer provides a 5-year warranty on their products. 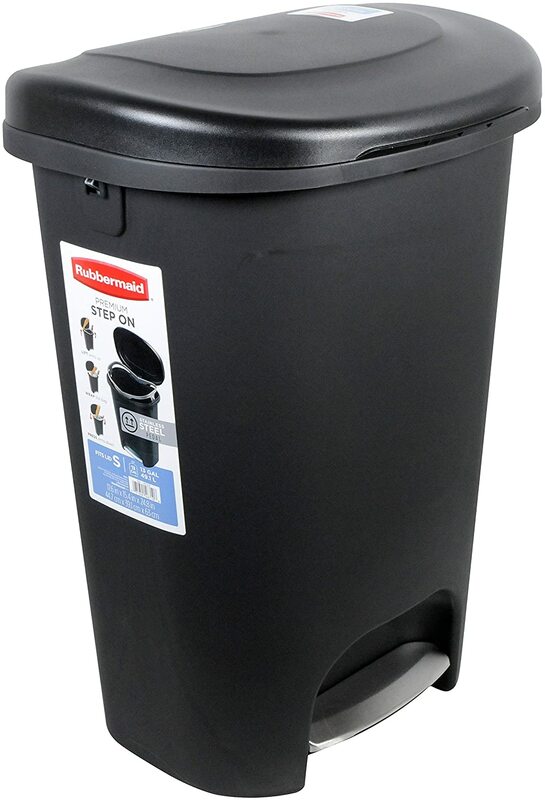 The Rubbermaid Step-On 13-Gallon Wastebasket (Rubbermaid) gives you an inexpensive, hands-free trash can option. The dimensions are a 14.7-inch depth x 17.6-inch width x 24.8-inch height with a 13-gallon capacity. It weighs 5 pounds. The Rubbermaid is constructed of durable plastic. Plastic gives you the ability to hide any scratches or dents that may result from heavy use. Unlike a stainless steel model, this trash can will pop back into place if it takes a heavy bump or gets something dropped on it. Lid opening is done with a plastic foot pedal. It will swing closed if you want or you can use an innovative mechanism built into the design that allows the lid to stay open. If you are having a large party, doing spring cleaning, or going through your pantry to throw away old food, having the lid open will certainly save you time and frustration. Some users have had problems with the lid not closing after regular use, necessitating them to close the lid manually. A rectangular shape helps this trash can to fit against a wall and out of the way of heavy foot traffic. It also comes in two colors, black or gray. Both neutral colors can fit into many different home decors and can help make the trash can nearly unnoticeable. There are bag holding clamps on the rim of the trash can to hold bags in place. When you throw heavy items into the trash, if the bag is only pulled tight over the rim, it comes off the can and begins to sink down into the trash can. If you don’t notice, you risk any food thrown in getting on the inside of your garbage can rather than in the bag. These holders keep things in place so they don’t fall or slip, preventing these unwanted messes. 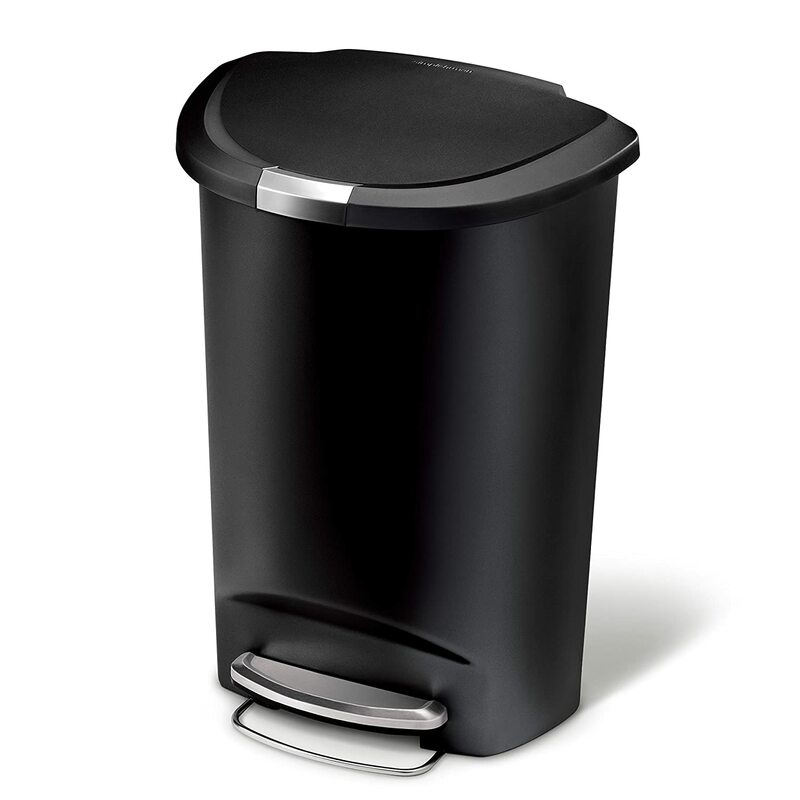 For an inexpensive trash can, the Rubbermaid seals odors in well. There is no locking mechanism but this trash can still manage to keep odors in the can when the lid is closed. Having garbage odors in your home does not create the atmosphere and appeal that you want. It is reassuring to know that you can have odors sealed in with a trash can that can be purchased on a budget. If placed too close to the wall, the lid may hit the wall. It can also cause the lid to not open as far as needed. It might be a good idea to measure the area where you want to place the trash can and add a couple of inches to account for the lid needing space to open and close. You probably already have a good idea of the trash can size that you need. Keep in mind that a larger trash can will allow you to take the garbage out less often. If you do opt for a larger can, be sure that it has some features such as a well-sealing lid or deodorizer to account for extra odors that may build up because of high volume. Measure the area where you plan to place the trash can. This way you will know the dimensions you need. If you are looking at a model with a bumper, incorporate extra space into the measurements to account for this. Also, keep in mind that some lids require extra space behind them to fully open. Stainless steel trash cans cost more, on average, but they also fit in well with stainless steel kitchen appliances. While you may like the look of a sleek stainless steel trash can, keep in mind that stainless steel dents and shows scratches. It can also be harder to keep clean than a plastic can. Plastic does not look as modern and sleek as stainless steel but it does have good durability. It can withstand bumps and scratches without damage. Plastic trash cans also come in a variety of colors. If you are looking for a can to blend with a color scheme or want to add a pop of color, you can find it with a plastic trash can. Preventing the spread of germs is a constant concern in the kitchen. Decide what kind of design you want, either hands-free or touchless. Hands-free design uses a traditional foot pedal. If you choose a can with a foot pedal, look at the construction of the pedal as it will get heavy use. There are trash cans that are made of plastic that have heavy-duty stainless steel pedals for greater durability. With this traditional type design, you will still be able to open your trash can without your hands but save some money by not going to touchless technology. Touchless technology uses sensors to determine when to open and close the trash can lid. Many people prefer this method as they end up touching the trash can less than with a hands-free design. Trash cans that incorporate this technology tend to look more sleek and modern. However, be aware that the more technology you have in the trash can, the more ways that it can malfunction. Sensors that get wet or dirty may begin to open and close at will. These types of trash cans also need batteries to operate. Beware of any trash can that requires a custom garbage bag size. Many of these types of trash cans can use standard sizes but be sure of that fact before you purchase. Look for trash cans that have some mechanism to hold garbage bags in place. This will prevent bags from slipping down in the trash can and will keep you from having to wipe down the inside. Some models have a special ring while others will have holding clips to keep garbage bags in place. Always read reviews of a model before you purchase. Look for patterns of features that break or don’t work as they should. You’ll be able to spot a product that isn’t living up to its promises this way. Finding a good kitchen trash can has never been easier. There are a variety of models in all price ranges that can keep odors in the trash can, provide hands-free entry, and have a large holding capacity.